Victorian Chemicals is Australia’s acknowledged leader in adjuvants. We have strong commitments to R & D, high quality manufacturing, high product performance, effective supply chain and; good customer service over the last 30 years. This has resulted in customers having a high degree of trust for Vicchem’s reputation and its products’ reliability. These customers come from a wide range of stakeholders such as agronomists, consultants, growers, distributors, suppliers and product testing laboratories. 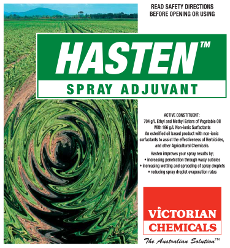 Our acknowledged leadership is best reflected in the agricultural chemical industry’s extensive endorsement of the HASTEN brand as the preferred adjuvant for use with their active ingredients. Increasingly, this endorsement is being extended internationally by our global product partners such as BASF and Bayer.